In this Aug. 28, 1963 photo, The Rev. 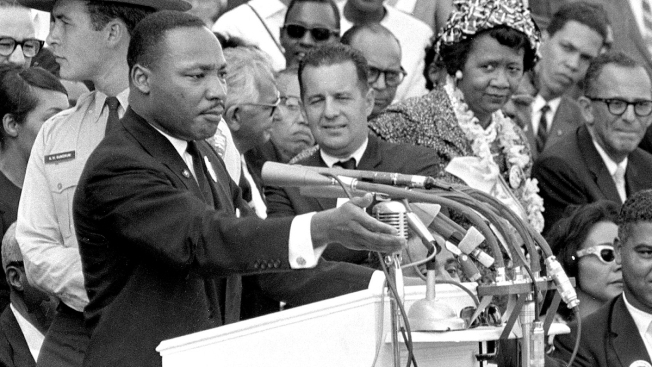 Dr. Martin Luther King Jr., head of the Southern Christian Leadership Conference, gestures during his "I Have a Dream" speech as he addresses thousands of civil rights supporters gathered in Washington, D.C.
Martin Luther King Jr. was surrounded by guns, even though he didn't like them. At times, armed foot soldiers protected the Baptist preacher and his family. As he led protests across the rural South, King often stood in proximity of guns — wielded by local police, state troopers or hostile people in the crowds. On April 4, 1968, King became one of America's most famous victims of gun violence. Just as guns were a complicated issue for King in his lifetime, they loom large over the 30th anniversary of the holiday honoring his birthday. Urban violence, mass shootings and killings of unarmed black males by police have caused alarm, touched off protests and revived the nation's conversation about gun control. President Barack Obama recently took executive action to tighten federal gun restrictions, invoking King as he urged citizens to press for change. "There is nothing in the history that suggests that Martin Luther King felt that guns weren't useful for self-defense," said Adam Winkler, UCLA law professor and author of the book "Gunfight: The Battle Over the Right to Bear Arms in America." ''Clearly, guns were used protect (King) ... (He) could not rely on the government." Inside the civil rights movement, some activists saw guns as a necessary means of self-defense. As a Southerner, King understood that strong culture of gun possession, even though he came to reject it, said Charles E. Cobb, Jr., a former field secretary for the Student Nonviolent Coordinating Committee and author of the book, "This Nonviolent Stuff'll Get You Killed: How Guns Made the Civil Rights Movement Possible." "If you went to King's house in 1955 or 1956, there were guns," Cobb said in an interview. "When they bombed his house in 1956, his first instinct was to apply for a gun permit. He moves toward nonviolence slowly. By the 1960s, he abandoned the idea of weapons for self-defense." Some blacks, Cobb recalled, jokingly referring to their personal weapons as "nonviolent pistols." "They would say, even as they were cleaning their rifles, how glad they were to be part of the movement," Cobb said. "They knew King wasn't going to be carrying a weapon, so people's attitude was, 'We're not going to let the white people kill him.'" "Dr. King's point was that the protection of one's home is self-evident, but he was quick to add that you're more likely to shoot a relative or commit suicide (with a gun)," Jackson said. "He refused to keep a gun in his house for that reason." "He decided he was not going to have a gun, and he didn't want anybody with guns around him," Young said. That incident has led some to embrace King as a supporter of the Second Amendment. In 2014, commentator Colion Noir posted a video on NRANews.com citing King's gun permit application as proof that he was not opposed to guns. "Dr. King was a nonviolent man, but even he understood the realities of self-defense and protecting his home and his family in the face of life-threatening violence," said Noir. After President John Kennedy was killed in 1963, Young recalled King telling him: "Guns are going to be the death of this country." "He said, Kennedy had Secret Service around him with guns and they couldn't protect him, which says guns can't protect you," Young said. According to a compilation of King's writings and speeches by Stanford University historian Clayborne Carson, King said in November 1963 that Kennedy's assassination could be blamed in part on Americans' casual attitudes about gun violence. King said: "By our readiness to allow arms to be purchased at will and fired at whim, by allowing our movie and television screens to teach our children that the hero is one who masters the art of shooting and the technique of killing, by allowing all these developments, we have created an atmosphere in which violence and hatred have become popular pastimes." King's nonviolent mentality stood in stark contrast to those armed, hate-filled whites who showed up peaceful protests, and the more radical black groups that emerged later, said King biographer Taylor Branch. "Even after black power made guns kind of popular in the radical movement, King said he would never carry a gun," Branch said. "He rejected all forms of violence and got stronger on it as he went along." Cobb, however, said many of King's followers "felt their duty was to protect the movement, grab a rifle" and drive away threats. "They didn't see any contradiction between saying they were part of the nonviolent movement and keeping their weapons clean and ready," Cobb said.